Incredibly long-lasting group as live performers (more than sixty-five years), but whose recording career barely lasted three years, and while their main focus in both was more pop oriented they spent enough time on the fringes of rock ‘n’ roll to leave their mark in that regard as well. The group got its start in the 1930’s when four of the members met and began singing together informally at a civilian work camp (federally funded projects designed to counter the rampant unemployment of The Great Depression) calling themselves The Scamps Of The CC Camp. Fast forward to nearly a decade later when in 1946 one of the former members met a musician in Kansas City who wanted to start a group and so the others were tracked down to see if they were interested and they formally became The Scamps, playing instruments as well as singing. They did some gigs locally, then travelled to California, caught the attention of Modern Records who signed them to a recording contract and made their debut on wax in early 1947. Their first full year saw them release five singles mostly in the pop vein but occasionally hinting at something more forward thinking. However when the recording ban began as 1948 rang in they were released from their contract so Modern Music, classy act that they were, wouldn’t have to pay them! A year later with the ban now over the group signed to Columbia, one of the major labels, which would seem to indicate they’d be pushed even further pop. Instead the reverse was true. Now billed as The Five Scamps the group tackled rock songs side by side with more pop offerings, yet it was the rock sides that were drawing notice. None of this ever hit big mind you, but it was rare to find an act of this time which followed this unusual career course: moving from pop to rock, especially going from indie label to major in the process. At no point did they appear pushed into anything in an attempt to appeal to a different audience, their hearts seemed to genuinely be in that work and they generally did it quite well. 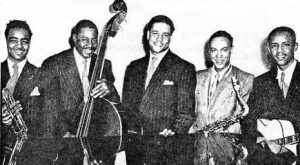 Yet by the end of 1949 they were essentially done as a recording act with only two subsequent records issued and neither one the same exact group, one having just a lone member present in 1951, the other in 1955 now reverting back to the original name The Scamps having added a sixth member. After that it was a life of club work around Kansas City with different formations of the group over the years but with at least some original members present for decades after their brief shot at glory on record which hadn’t really led anywhere. Or so it would seem. By the twenty first century the group managed to have a street named after them in Kansas City thanks to their longevity and they continued playing live gigs with members well into their seventies and eighties, probably without anyone who saw them who actually listened to those records from a half century before. As relative failures go they were incredibly successful.